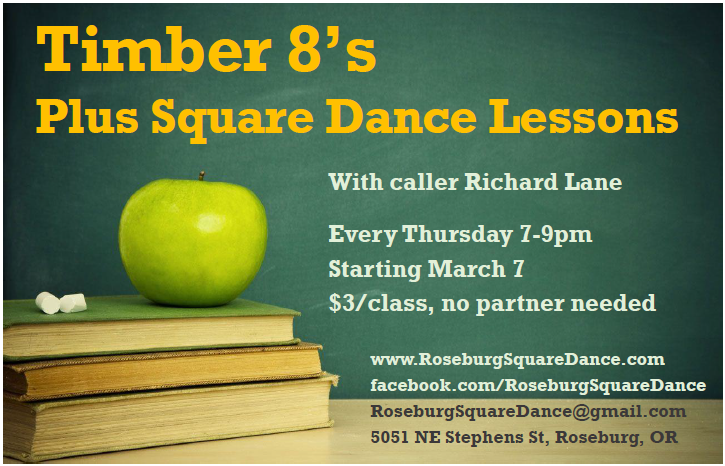 Join us for fun Square or Round Dance Lessons! All classes at the Buckeroo Barn, 5051 NE Stephens St, Roseburg, OR. Modern Western Square Dance is different from the square dance you might have learned in grade school. We dance to a variety of music, from oldies to country to recent hits. Solos, couples, and families will be getting together to socialize, have fun, and practice this easy to learn social dance. It is great mental and physical exercise, too! No experience required at all. Buckeroo lessons start in autumn and continue weekly on Mondays 7-9pm with Chuck Simpkins. Each lesson $5. Winter lessons won't be held January 2019 so September 2018 is your chance to join! First class Monday, September 10th at 7pm, registration starts at 6:15pm. September 10th & 17th will be free intro days open to everyone to try it out. Already an experienced mainstream square dancer? Take it to the next level with Plus lessons hosted by the Timber 8's on Thursdays starting March 2019 from 7-9pm with caller Richard Lane. Each class will be $3 & no partner is needed. Come to learn, brush up, or support the soon to be plus dancers. Contact us via email or Facebook if you have any questions. The round dancers will have class & dance on Tuesdays at 7:00pm with cuer Neil Koozer at the Buckeroo Barn. New rhythms start in September and January. Couples and singles welcome! Call 541-459-3709 for more info. During Summer 2018, dance/class will be on Thursdays so everyone can enjoy Music on the Halfshell. Caller clinics are hosted in Roseburg periodically by different callers.